Overall winner Akito Watabe claimed his seventh World Cup win of the season in Nordic combined skiing Saturday. Germany won the gold medal in Nordic combined. Johannes Rydzek wins the Nordic combined large hill gold medal at the Pyeongchang Olympics, leading a German sweep of the podium. Germany's Eric Frenzel erased 38 seconds after the ski jumping stage of the Nordic combined and surged ahead in the 10-kilometer cross-country race to defend his gold medal in the event. 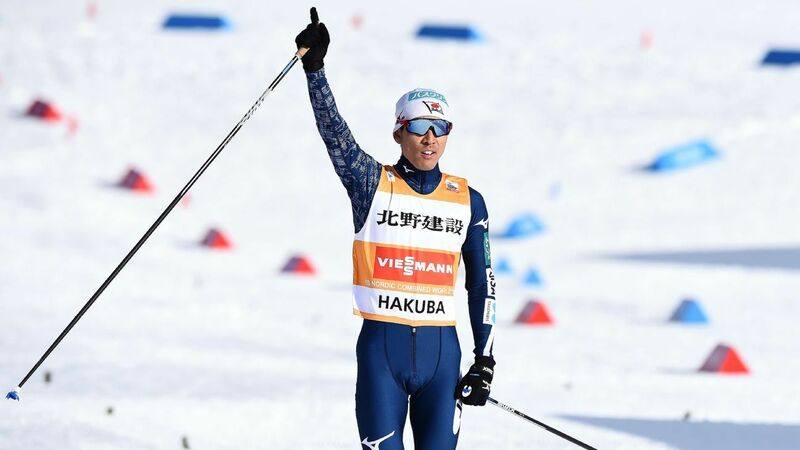 Akito Watabe of Japan won his fourth straight Nordic combined World Cup event on Saturday to enhance his position as a gold medal contender at the Pyeongchang Olympics. Bryan Fletcher qualified for his second consecutive Olympic team in Nordic combined after rallying for a victory at the U.S. trials Saturday. Former Olympic Nordic combined champion Jason Lamy-Chappuis has a right leg injury that could jeopardize his participation at the Pyeongchang Games. Charlotte Kalla gave host Sweden its first gold medals of the Nordic skiing world championships by winning the women's 10-kilometer freestyle race Wednesday, while American teammates Jessie Diggins and Caitlin Gregg surprisingly took silver and bronze. From big upsets in hockey to I-Pod's breakthrough to a local joint that make made us feel at home, our Sochi staff shares its most memorable moments from the 2014 Winter Olympics. Forrest: Did Sochi Olympics accomplish what Putin, country wanted? As the Sochi Olympics come to a close, Brett Forrest examines whether the event lived up to its billing for Russia now, and beyond. Cross-country ski specialist Magnus Moan made up a 25-second deficit on the first leg and Norway outdueled Germany and defending champion Austria to win Olympic gold in the Nordic combined team event Thursday. Ski jump training for the Nordic combined large hill team event at the Olympics was canceled Wednesday because of the condition of the landing area following a steady, daylong rain. For Russians, the Olympics have not been a thrill -- they're from here. It may explain why the country's mood, especially in Sochi, has been generally subdued so far. Joergen Graabak broke away from a five-man group with about 100 meters left in the cross-country race to give Norway a one-two finish in the Nordic combined large hill event Tuesday at the Sochi Olympics. Taihei Kato of Japan broke his left arm Tuesday when he fell hard while landing during the ski jumping component of the Nordic combined large hill event at the Sochi Olympics. Normal hill gold-medal winner Eric Frenzel of Germany will start Tuesday's Nordic combined large hill final despite a virus. You don't have to go far to find locals in Sochi who are quick to tell you how important hockey is to the country. Brett Forrest found one local hangout where nerves were rattled during Team Russia's men's hockey opener. Eric Frenzel of Germany led after ski jumping and then powered home on the cross-country course to win the gold medal Wednesday in the Nordic combined individual normal hill at the Sochi Olympics. A look at some of the events on our radar at the 2014 Winter Olympics in Sochi, Russia. Since it won the Olympic bid, all Russia wanted was a chance to show that it was a modern, forward-looking country. Over the next two weeks, it will have this chance. From the weather to the dramas to the inspiring stories, the 1994 Lillehammer Games not only set the standard, they also best represented the Olympic ideal. The United States has chosen six-time Olympian Todd Lodwick to be the team's flagbearer at Friday's opening ceremony for the Sochi Games. Foudy Asks: What Comes to Mind When You Think of Russia? Julie Foudy asks U.S. Olympic athletes for their impressions of the Games' host country Russia.